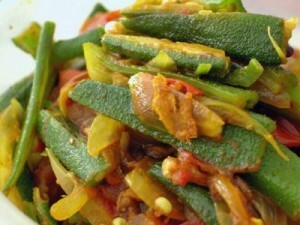 Bhindi Batata recipe by Nazia Nazar at DesiRecipes.com. Wipe the Okra with a damp cloth. Cut each Okra into half, cut each half into 2 lengthwise and set aside. Heat the oil in a pan, fry the mustard seeds till they "pop". Add the Onions and fry for 2 3 minutes. Reduce the heat, add the okra , potatoes, salt , turmeric powder, red chilly powder, coriander powder and green chillies. Toss the contents of the pan well. Cover the pot and cook for 10 15 minutes, tossing the vegetables every few minutes. Stir in the Tomatoes. Mix well and cook for a further 10-15 minutes. Sprinkle the coriander leaves on top.